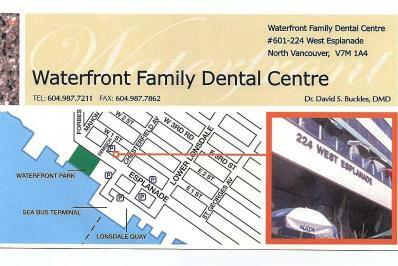 The Waterfront Family Dental Centre provides quality dental services in a relaxed, comfortable environment. Whether you need a check-up and routine cleaning or something more complex like crowns or surgery, we encourage our patients to play an active part in choosing the most suitable treatment options to meet their needs. We employ digital X-rays which provide better images and less radiation than conventional film. For more info about how we can help you, please view our services page. Dr. David Buckles has been in dental practice since 1988. He is a dental graduate of the University of Manitoba, and has completed the General Practice Residency program at Vancouver General Hospital. He has a wide range of experience from over 25 years in all aspects of general dentistry. He also teaches part-time at the UBC Faculty of Dentistry. In addition to our normal Monday, Wednesday and Friday hours, evening and Saturday appointments are also available and we accept most insurance plans. Plus, our facility offers free parking. We’re open one Saturday per month and some evenings. Please call us for details, and we look forward to seeing you! Open one Saturday per month and some evenings. Please call us for details.